Man, I’ve been gone for far too long. I mean my last post was like back in the Reagan administration! So I thought I’d come back to blogging with something not really too techy but nonetheless important. I want to talk about weighted grades and how bad they are and what we can do to replace them. Weighted grades utilize categories and then each category has a certain percentage. I know that’s not very clear but check out the example we will be using for this post below. As you can see if you add up all the percentage you will reach 100%. This is the basic set up for weighted grading. Teachers can have more or less but it must add up to 100%. It all has to do with volume. 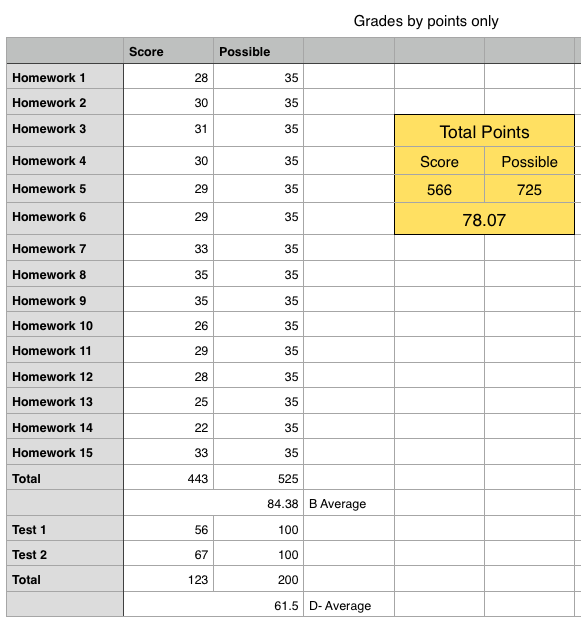 If you use a point only grading system, where everything has a point value and no categories, and you have fifteen homework assignments that total 500 points and two tests that total 200 points, then you can see how homework grades can overpower the assessments. Check out the example below to see what I mean. Let’s assume this is a typical student with no extreme test anxiety. As you can see this student (completely fictitious by the way) did reasonably well on her/his homework (B average) but when it came time for the tests, there is a big drop. You can also see they are nearly failing, but when you see the C+ on the final grade you think – this student didn’t do too bad. The final grade doesn’t reflect what is happening. What is happening was that the homework grades were overpowering the test grades thus not giving a realistic depiction of what is happening. There can be a lot of explanations here, maybe they were working on their homework with a tutor, friend or parent but maybe didn’t prepare for the tests too well, thus the student had not reached any mastery at all. So people came up with weighted grades. Let’s take a look at those same grades but weighted. Let’s make the weighting for these grades equal 50% for homework and 50% for tests. What we need to do is multiply the percentage by the average for each category and then add them together. Now the average is 72.94%. A little more reliable. Now, let’s re-weight those categories. Let’s make tests 70% and homework 30%. Now the result is a 68.36% (D+ grade). This works even better. You are probably saying to yourself Patrick – what’s the problem? This seems to work! At first it does but let’s look at a more complicated scenario in the next section. In this example we will look at student with 4 different categories listed below. Now let’s go take a look at Fred’s grades (I like the name Fred). So check out the Fred’s academic performance. He has a steady 90% A- right now but that will change. 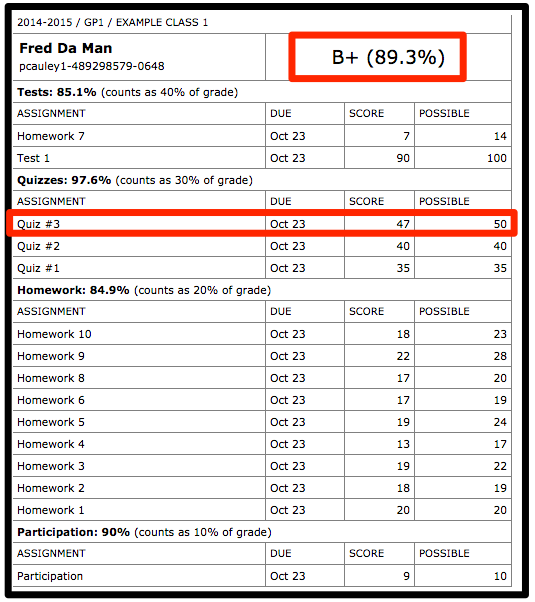 I am going to give Fred an A (94%) on his next quiz and watch what happens to his overall grade. Holy crap! Fred had an A-, received an 94%, A on his last quiz and his grade dropped from a 90% A- to a B+. Now let me say that one more time. 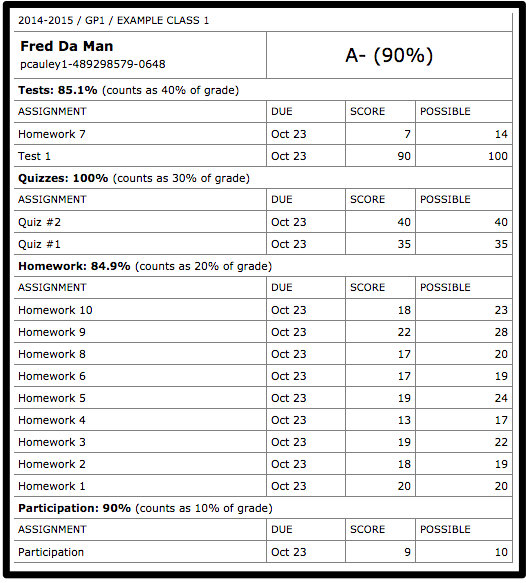 Fred had 90% = A-. He took a quiz and scored a 94% = A. His last grade was higher than his overall averaged yet it dropped his grade! So what the hell happened here? Why did everything go all pear shaped. Why did up become down? For that we need to look into the math. The first set of numbers represents the test weighting and so on. What happened was that Fred had a 100% quiz average before quiz #3. When he scored an A, it dropped his quiz average which ultimately dropped his overall average. So there it is – the correct math explaining why a students grade dropped from an A- to a B+ even though they scored an A on a quiz. This is not some mythical grading unicorn that doesn’t happen ever – this happens all the time, every year. I mean how do you explain that to a student or a parent? How do you show them this (or similar equation) and expect that to justify that their student did well. It’s not good enough. It simply does not seem fair. Another issue with weighting grades is the math behind it. As you can see, the math behind it is not that difficult, yet I would guess that over 50% of teachers I’ve encountered who use weighted grades could not explain it to their students or parents. I’ve even have had high school counselors come to me and inquire about situations like this. These are smart people but in their mind it doesn’t make sense even though it is mathematically correct. Now if the teachers and counselors are a little unclear about it can you guess how many students know how to calculate their grades? Yep – shockingly low. Shouldn’t people understand how this is calculated? You bet they should. Transparency within school is key to its success. It shouldn’t be a black box where the only people who knows what is happening are the people working there. The first thing to do is take weighted grades and dump them at the beginning of the next school year. Just dump them man – get rid of them. Then move to a point only system. Here you can have a few a choices of how to deal with points but it boils down to good planning. This solution is give all teachers 1,000 points. They have to create assignments, assessments, projects, whatever but it must total 1000 points. This forces the teacher(s) to plan carefully, thoughtfully and make sure that no entry can overpower another entry. That way everyone knows – without asking- how the grade is calculate. Just add up all the points and divide by 1000. Simple for admin, parents and students. The downside to this is that the teachers won’t be too happy. Teachers like the freedom to evaluate and change their course on the fly as they needs arise. Also, what if they spend too much time on a lesson and can’t get all 1,000 points in? These are legitimate concerns but it does give a solid structure that gives the teachers. Another argument against this is that there are some classes where it may be difficult to work 1,000 points such as drama, music or art classes were performance and long term projects are the norm. Another possibility is to give some freedom but with a tiny catch. Allow teachers to use a point only system but allow them to come up with what the final number of points will be. However, teachers need to plan and submit all their plans for graded assignments/assessments. It should also be revealed to students/parents as well. Transparency is key here. Another more radical approach is dumping grades all together but that’s a post for another time. For now, however, if you’re using weighted categories – try dumping them to a more transparent and fairer point only system. What do you think? Leave those comments below. This entry was posted in Opinion, Patrick Cauley and tagged online gradebooks, weighted grades. Bookmark the permalink. Thank you so much for this explanation. I’ve been struggling to understand how my son’s grade in the class could move so dramatically if he missed turning in a single homework assignment. When they said things like “In this class, tests are worth 50% of your grade”, I figured it meant that out of 1000 points available to be earned, there were 500 points from tests. But now I’m learning 1point does NOT equal 1 point at all! That seems to really demotivate students when averages are so fragile if they are more challenged in the heaviest weighed category. My wife is a teacher and explained that it’s much easier for the teachers this way and that it’s been this way for a long time. Ugh! Thanks for the comment and as an educator, it is definitely a problem. Most parents, students and heck, even teachers, do not understand how weighted grades work. This “black box” of grading often leads to problems when final grades cannot be fully understood or explained. It can lead to distrust between the parent and the teacher (a relationship that needs to be strong) which can ultimately lead to distrust between the student and the teacher which can rip a class apart. I’ve experienced this distrust when a parent felt I was losing her child’s work and this rumor spread around and took weeks to dispell even though it was not true. In the case with weighted grades the teacher may not be able to fully explain the system and that is very damaging to their reputation as a professional educator. There are not easy answers here but hard questions should not be avoided or swept under the rug. Changes can be made from one grading period to another – it is possible. I’m beginning a “movement “ and plan to put it to the school board, in which teachers are not allowed to weight grades anymore. I needed an alternative solution and found it here. Thank you so much! Thanks for the compliment and best of luck with the new implementation. Change is tough but stick with it. I’d be curious to see how it turns out. I know http://education.uky.edu/EDP/guskey Guskey was a bit of a “fad” thing, but his criticism of traditional grading practices (of which weighting is one part) is thoughtful, valid, and makes a difference in how we think about learning and assessment. We moved to standards-based grading, and while not perfect, it produces a better product than the typical traditional grading I’ve seen in the past. Curious to see your flat point system. I suppose if we really wanted to think out of the box, a individualized, gamification-style assessment system would be pretty cool. Bill – a gamification system? Man you are blowing my mind right now. Traditional grading is not great to be sure but weighted grades have too many “hiddden” features that can allow a teacher with the know-how to rig it at the beginning to report very few F’s. I like the idea of standards based grading and another school in our city is trying it out and I know the Shekou International uses it. It does seem to be a lot of work, training but if done correctly – I think it gives the students, parents and school a very clear idea of how a student is really performing. Didn’t I initially create the flat point system over a few tall cool beverages at the Grand Excelsior? I feel like I was ridiculed when I suggested we use a game-based flat point system. I even had a few math people support the concept. I have been using flat points system for a long time. I can even tell students that per semester there are X number of points to earn or lose, which helps them plan their slacking.